I’m in the most recent issue of Exclaim! Magazine in the Meet & Greet Section. 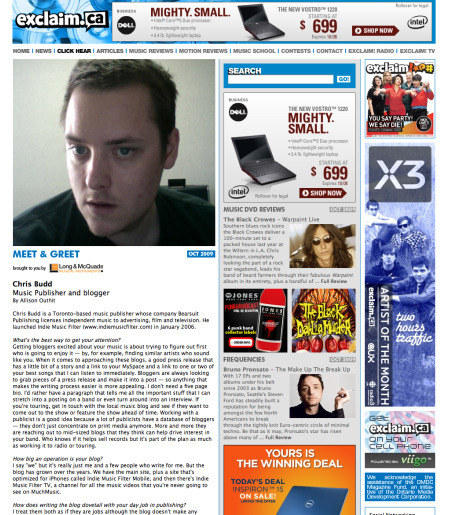 This is the place in the magazine (and online) where music industry people are interviewed on a variety of topics. In this specific interview, I was mainly focusing on blogging, but we talked a lot about finding new music and the publishing world. Unfortunately, when the article was printed, the article said that I was a Music Supervisor, not a Music Publisher. Hope that doesn’t confuse anyone or make the supes think I’m competing with them. I’ve had them fix the online article (which is here) but the print article (coming out today) will still have the typo. I wonder if that’s going to make my CD mail increase like crazy…..